Built Today, Ready for Tomorrow. eCommerce stores are the force behind our modern day economy. We specialize in all major eCommerce platforms including: BigCommerce, Shopify, WooCommerce, Volusion &amp; More. Let’s say John creates a music website. He starts out small and ships a CD every time a new order comes in. As time goes on, John’s website starts to grow quickly and he’s completely inundated with orders. What a great problem to have! John realizes he can save himself time and his customers money by offering a digital download instead. That’s great, except John’s eCommerce platform doesn’t allow for file sharing. He’s now stuck with migrating his website or starting over from scratch. When we build your website, we’ll sit down and discuss where your business is now and where you hope to be in the future. What are you goals? How fast do you expect to grow? While you might not need some features now, you may later down the line. We always try to build your website with forward thinking in mind. Ecommerce goes beyond just the design of your website, it’s thinking about and integrating logistical power. Software automation can bring joy to some of the most mundane aspects of your business. It’s always exciting for us to show clients how easy it is to automatically print shipping labels on their new system (especially after years of copy & pasting). 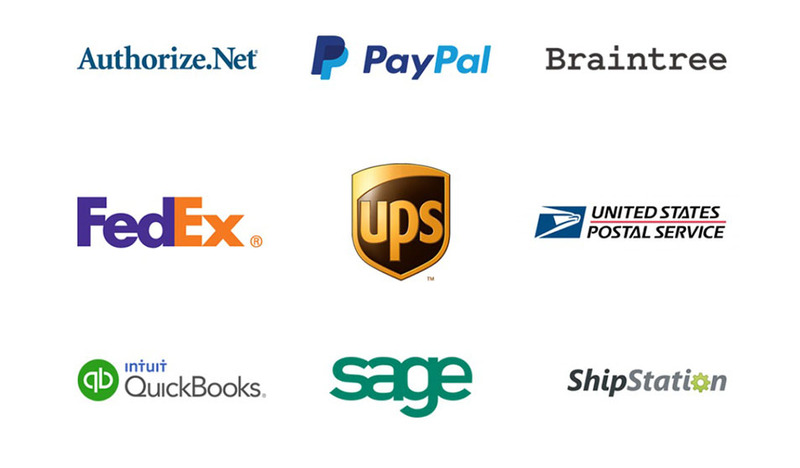 Our team is able to integrate applications such as Authorize.net, PayPal, FedEx, USPS, Stamps.com, ShipStation, QuickBooks and more into your ecommerce store. From your warehouse to your customers location, we integrate the tools necessary to keep your business moving forward. Moving your products from one platform to another can be a real nightmare. While most eCommerce stores allow you to export your products to a CSV master file, importing isn’t always so simple. Each eCommerce platform often uses it’s own set of header rules and in some cases, take WooCommerce for example, require two separate CSV files that are linked by special ID numbers for child products. Whether you are moving from one platform to another or attempting to upload your store products to Amazon Seller Central we’ve got the experience to get the job done quickly. We have successfully migrated thousands of products from one platform to another. 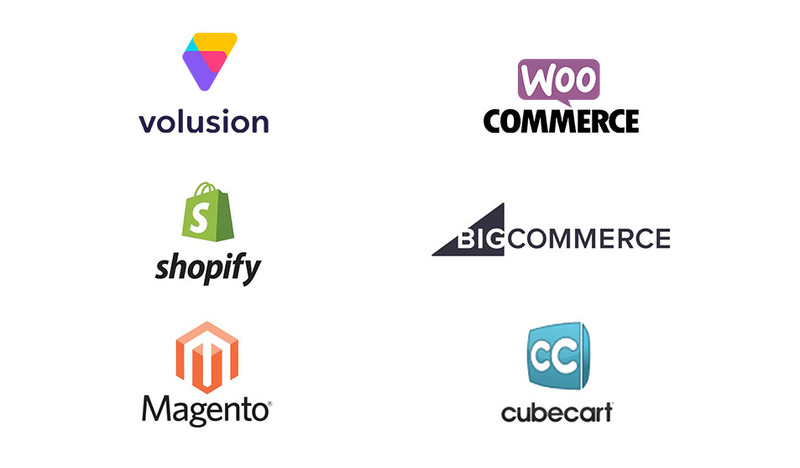 We can help you migration products from BigCommerce, WooCommerce, Shopify, Volusion, Cube Cart & More. Because products online aren’t tangible, it’s important that they are showcased in the best possible manner. We ensure your product are encased in a beautifully designed and functional e-commerce store. No matter your industry, we have the experience to build a site that engages your customers. Take a moment to fill out our new website request form. This will help us to better understand your needs. After submitting your information, we’ll review it and get in touch with you as soon as possible.